salvation. answered pray. the hope of heaven. grace. my husband who works hard to provide for his family. his job. he gets to do what he loves (plus he is good at it) everyday. my job as a stay-at-home mom. my employer. aka, baby bentley von. my son. i never really thought that i would have a son. he is a delight. family. i love all the parents in my life. all the sisters & brothers. and all the cousins, aunts, uncles, & grandparents. i am so blessed to have so many people who love me. marrying shawn only increased that number. our house. it meets our needs, small enough to be able to clean quickly, but just big enough to be able to entertain & house guests. the washer + dryer. they came with the house, so needless to say they aren't energy efficient (you have to run the dryer more than the regular cycle if you want dry clothes) BUT that was more than we had ever dreamed. i love not having to hoard quarters + lug laundry baskets. my king size bed. you don't appreciate your own bed until you sleep somewhere else. no matter how great that bed is, yours is better. hand-me-downs. a dreaded word as a kid (and actually, who are we kidding, everyone loves them but for some reason we aren't allowed to say it out loud). bentley is well clothed & we have been able to save so much money because of clothes we have been given! bendy straws. they make my ice water easy + fun to drink. coupons. they add some excitement to grocery shopping, and save us money. i look forward to getting my hands on the sunday paper for this sole reason! skype. keeps me in contact with my sister who is 16 hours away. even though her husband says it doesn't count as "real" social interaction, i look forward to our calls that are usually daily. it is a genius invention to keep her involved in my baby's play time & me up to date on her growing belly. i'm going to wrap this up. i feel like it could be an endless rant because when it really comes down to it, i am thankful for practically every item in our house. but who wants an itemized list?! i hope you take time to appreciate that big & small things that make up your daily life. you will be surprised at how exciting it can make even the littlest of things... i am thankful for my bathroom hand soap. it cleans my hands and smells really good. is this how you take your turkey out of the oven? shiny heels & ruffled apron? imitating? what do you mean, Mary? 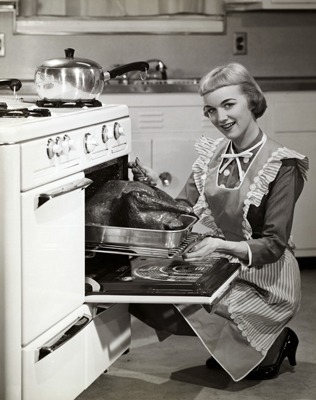 I cook a turkey everyday and kneel down like that for real. hahahah I heart the apron! Have a good trip, Anna!! That is a great list,Anneliese! Happy Thanksgiving!! I hope you can skype Mary with a similiar outfit! You already have the smile!